After some setbacks, the U.S. is making progress in its diplomatic struggle with China. Many policymakers and analysts would agree that there is a surging soft and hard power struggle between China and the United States for dominance in the South China Sea and Southeast Asia. I argue elsewhere that China has made significant inroads in what was long a region of U.S. soft power dominance. But Washington is making some progress in regaining lost ground. Soft power is the capability to use economic or cultural influence to shape the preferences of other countries. Hard power is the use of a coercive approach to international relations. Of course, hard power usually matters more in the end but the two types overlap and integrate in kind and effect to become “diplomacy.” In a clever reversal of Clausewitz’ famous dictum, China’s first Premier Zhou Enlai once quipped, “All diplomacy is a continuation of war with other means.” In the particular situation of the South China Sea and Southeast Asia, soft power may win the contest without hard power coming into play — at least explicitly. The United States is clearly the superior military power — both overall and in the South China Sea specifically, although China is eroding the U.S. advantage there. But China seems to be gaining the soft power advantage by virtue of its geographic position as a permanent part of Asia and its burgeoning economic largesse. The United States has consistently and strenuously argued to its allies, friends, and any others that will listen that China wants hegemony in the South China Sea and to that end is “militarizing” the features it occupies; bullying its rival claimants; threatening freedom of navigation; violating, as well as trying to revise the applicable international law and order; and thus generating instability. China has its own narrative. Beijing counters that it is only exercising its right to defend its territory, just as other claimants are doing; that it is not threatening and will not threaten commercial freedom of navigation; and that it is willing to negotiate disputes bilaterally as agreed in the 2002 ASEAN-China Declaration on the Conduct of the Parties in the South China Sea as well as willing to enter into provisional arrangements of a practical nature to harvest resources in the disputed areas (as called for in the UN Convention on the Law of the Sea, or UNCLOS). China claims that it is the United States — an outsider and non-party to UNCLOS — that is creating instability with its provocative military presence, intelligence probes, and Freedom of Navigation Operations (FONOPs), because Washington wants to continue its hegemony in the region, including the South China Sea. China’s soft power campaign has made progress in winning some ASEAN nations to its side on these issues — like Cambodia, Laos, and perhaps Myanmar. Beijing has even made surprising inroads with U.S. allies Thailand and the Philippines. It has caused others like Brunei, Malaysia, and even U.S. strategic partner Singapore to hedge and waffle. Vietnam is clearly in the U.S. camp, and the de facto leader of Southeast Asia, Indonesia, seems to be leaning more that way. Now other “outside” nations are beginning to publicly back the United States — at least regarding “freedom of navigation.” Previously, U.S. allies Australia, France, Japan, New Zealand, and the U.K. had demurred — even under considerable U.S. pressure — to join its FONOPs in the South China Sea or to at least undertake some themselves. But at June’s major Asian security gathering, the Shangri-La Dialogue, France and the U.K. announced that they would soon be conducting their own freedom of navigation exercises in the South China Sea. These were executed, but it is unclear whether they emulated the U.S. FONOPs by challenging China’s requirement to have permission to sail within 12 nautical miles of its occupied features. Judging from China’s muted reaction, they may not have done so. Nevertheless, Gavin Williamson, the U.K. defense secretary, said that the United Kingdom intended to send the “strongest of signals” on the importance of freedom of navigation. He made this announcement from a U.K. frigate docked in Singapore, a day after U.S. Defense Secretary James Mattis accused China of “intimidation and coercion” – the latter a possible violation of the UN Charter. Australia has become more outspoken in support of the U.S. position on freedom of navigation. In April, after three Australian warships were queried by Chinese warships in the South China Sea, Prime Minister Malcolm Turnbull asserted the Australian navy’s right to operate there. However the details of the incident are unclear as to whether the Australian warships challenged China’s claims. Even New Zealand, another U.S. ally, has publicly and explicitly stated that it believes China poses a threat in the South China Sea to the international community. This is significant because New Zealand’s leaders had previously been careful not to specify China as a threat when speaking about the South China Sea dispute. Predictably, China expressed anger over the statement. Japan’s Prime Minister Shinzo Abe envisions a “free and open Indo Pacific” linking Japan, Australia, India, and the United States in an effort to uphold the rule of law — especially freedom of navigation. Translating words to action, Tokyo announced that it will soon send a large helicopter carrier to the South China Sea and the Indian Ocean. But what about other claimants in the South China Sea? Malaysia, under former Prime Minister Najib Razak, had been relatively quiet on the South China Sea issues, even showing tolerance toward China’s behavior there. But his successor, Mahathir Mohamad, seems less favorably inclined toward China, perhaps providing an opening for the United States. In the Philippines, it was a major victory for China when the Duterte government decided to put in abeyance the international arbitration decision in its favor against China, and to shift its foreign policy to a more neutral position between China and the United States. But the government is facing an increasingly popular domestic backlash against its “soft” policies toward China — and implicitly, its turning away from the U.S. An anonymous high-ranking Philippines military official said of the upcoming first-ever China-ASEAN maritime exercises this year in the South China Sea, “The drills are intended to be part of confidence-building measures. But at the tone the nations are speaking now, I don’t think it’s a good idea [to hold the exercises].” This may favor the United States in its contest with China for the South China Sea. 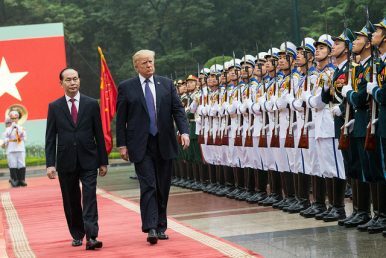 Vietnam, a particularly vociferous rival claimant in the South China Sea, has been particularly outspoken in welcoming the deployment of the U.S. Navy. Indeed, Vietnam will host the first visit of a U.S. aircraft carrier battle group later this year. The political use of the U.S.-hosted Rim of the Pacific exercises has also advanced the U.S. position. With its very public exclusion of China and the continued participation of six ASEAN countries in the largest multilateral military maritime maneuvers, the United States can claim they are demonstrating “passive support” for the U.S. position. So although China has recently been winning the diplomatic “war” in the South China Sea, the United States is making some progress in rebuilding its eroded soft power. Stay tuned for the next chapter in this seminal struggle. As U.S. policy toward China becomes more confrontational, its soft power in Asia is waning. Toward a New Maritime Strategy in the South China SeaA Recipe for Disaster in the South China SeaDownplaying Sino-US Tensions in the South China SeaASEAN Summits Another Lost Opportunity for Progress on the South China Sea The South China Sea: Freedom of Overflight or ‘Unlawful Activities’?